This is me... changing out the drain pump in the washer. Before I got to this point, I had to empty everything out of the laundry room. And let me tell you, there was a lot of stuff. It's embarrassing to admit that this is pretty much how it always looked. You see, once I redid the entryway closet (check it out here) I lost a place to put the vacuum cleaner and a ton of other stuff. So yeah, it piled up in the laundry room. To make things worse, I only had one shelf in the laundry room because the other was removed when we put the pocket door in. A few months ago, I built a platform for the washer and dryer because I refused to spend $500 on the ones Samsung sells. I added a top to it but that was something I regretted. Why? Because when the washer went out I had to take it off and it tore up the wall. Needless to say, I didn't add it back. The top we ended up taking off. Once I cleaned everything out, I realized there was a good amount of space that I could use. I went to work and started putting together plans. I knew I needed a place for my vacuum, a place for laundry baskets and a place for the litter box. I set those three things on the floor and determined the spacing I needed and then headed to HD to get plywood for the build. I could have totally skipped this step because I had enough plywood leftover to build the cabinet system, but I had planned to stain the cabinets and so I wanted birch (I later changed my mind and decided to paint). Once I had the plywood I did a test fit to make sure my spacing was good. Once I saw all was good, I demoed the shelf and started building. I knocked out the cabinets in a day (surprisingly). Once the shell was primed, I started making cabinet doors. I used the a tongue and groove system so they would be sturdy and look nice (a tutorial for that will be up soon). I really thought about leaving it this style, but then decided it was too plain. You guys know I love my trim! I trimmed them out, painted them and then went through the fun process of installing them (one of my least fave projects now - installing hinges). After finishing the doors, I built some chunky shelves for over the washer and dryer and then started painting. Of course, I also ended up making the new light fixture along the way (check it out here). All-in-all, it only took about 2 days worth of work and cost around $100 to transform this space. When all was said and done I was really happy with the results. And while the photos don't nearly do it justice, I hope you enjoy the new space! Check out the views from the door (you will see why it was hard to photograph). All of my laundry products were on the lower shelf. I put the Tide pods in an old urn/vase I've had sitting in my pantry for a year. I made it a point to only put out the products I use. No need to clutter it up. I also knew I needed a place to put lint, so I picked this little box up from Hobby Lobby for around $10. 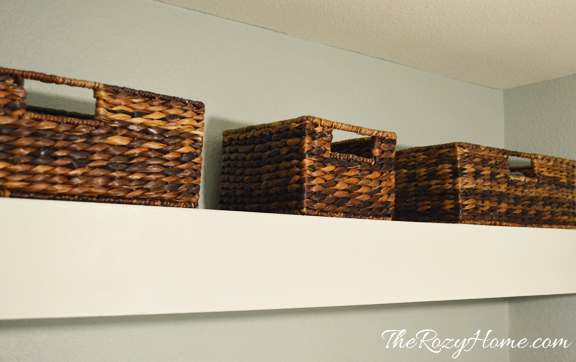 I used old baskets my hubs has had for years for the upper shelf - where I put things I don't use that often (light bulbs and the like). Under the platform, I used baskets I've had for about 10 years. The basket on the left holds dry cleaning while the basket on the right is used to take clean clothes upstairs for folding. Since I was losing a clothes rod, I created a new hanging system using furring I spray painted blue and knobs from Hobby Lobby (cost $15). Check out that tutorial here. I created a large cabinet section to house my vacuum cleaner, steamer, Spot Bot, brooms, etc. I created a center cabinet for holding the laundry baskets based on stuff I saw on Pinterest (which originated from Ana White). On the right, there is a cabinet for my drill charger and stuff for the cat. At some point I will create a cover for the litter box, but I want the cat to get used to using it in it's new location first. I grabbed some huge baskets from Target for around $13/each. They are massive! And they hold so much junk! The far left is the paint basket (paint supplies and small cans of paint). The middle basket holds random tools and wood glue. The basket on the right hold, get this, a sewing machine! I told you - they are huge! Little man made it in pre-school and I've had it in my office ever since. I love looking at his little hand prints and it was my way to sneak an elephant in! So there you have it! 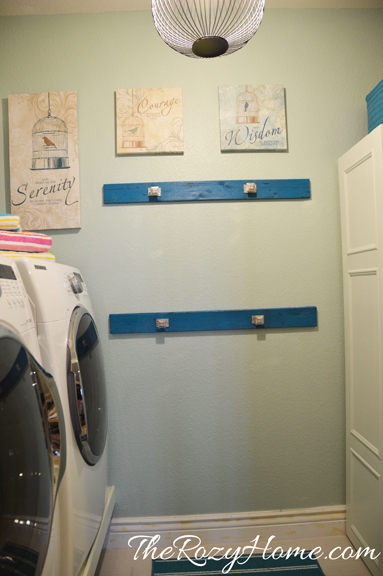 For around $100 I transformed our laundry room from a place that held clutter (and occasionally clean clothes), to a space that served a specific purpose. I love this room. I have a place to put all of my paint supplies, the tools I use almost daily AND it's nice and cleaned/organized. I like it so much, in fact, that instead of making sure the door is always closed, I leave it open so I can get a glimpse of it from time to time. Never thought I'd be saying that about my laundry room.